At about 445PM on 09/10/16 the Transit Police told me to leave an industrial area under a bridge in Somerville, down the road from Bunker Hill Community College. I started visiting this place in early 2014, after I arrived in Charlestown. It is about 1/2 kilometer from my sleeping area, that is on the same road. When I began visiting this obsolete industrial area, it was covered with brush. I'm guessing it was unused for decades. It is out of public view, on a road that is infrequently traveled. There was an abandoned 18-wheeler that I used for shelter, near an unoccupied warehouse. Other than the occasional homeless people, the place was deserted. Here, I would often stay on Sundays, & occasionally other days that I didn't go to the library, or my mother's apartment. From early 2014 on, I regularly used this place to exercise, rest, & study. It was a somewhat peaceful environment, away from the degraded citizens. "I visited this place multiple times over winter. There was no one there, & no sign of any industrial activity for years, possibly decades. Lots of vegetation, graffiti, trash, etc. The area has definitely been abandoned for years." 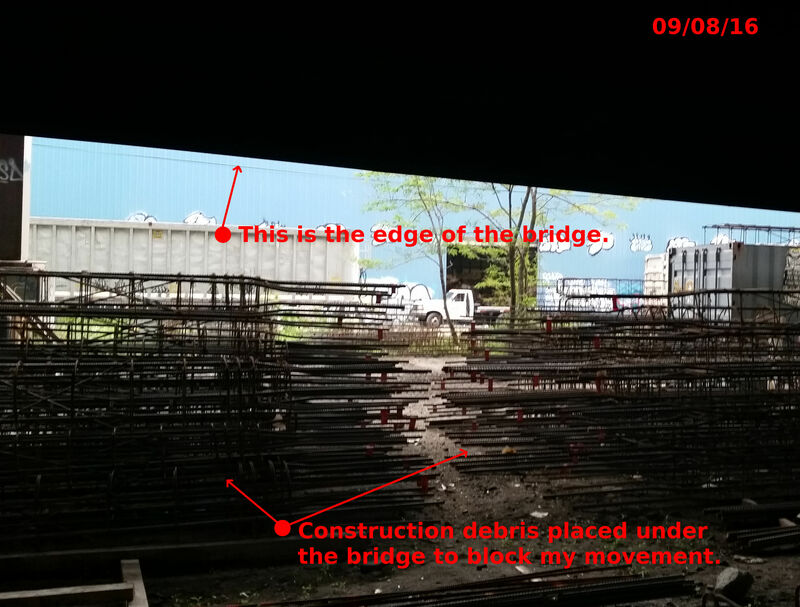 The first area denial tactic was a perpetual maintenance project, launched in the warehouse, near the 18-wheeler, where I stayed. "I noticed one day in the spring that all of a sudden a construction project appeared [in the abandoned warehouse/building]. ... This construction crew seemingly works on Sundays. Now the large sliding door [at] the building is open, suggesting activity & eventual commotion." There would be lots of commotion. Shortly after that, the chaos began. The brush was cleared away, the truck that I used for shelter was removed, & the landscape was modified to make it unsavory. From then on, the sliding door to the building was open virtually every time I visited. Soon there would be the stench of garbage (malodorant), frequent beeping sounds made when forklifts go in reverse, & flashing lights. "On this day there was almost constant noise at [the] industrial area I stay on Sundays. ... I don't know exactly when I started going to this place, however, it was after I arrived in Charlestown. ... The place had lots of plants because it was abandoned, probably for years or even decades. There was a [abandoned] building near it, & the doors were never open. Then, probably sometime in 2014 they started a construction project & removed all those abandoned cars. They removed the brush from the area. They also placed various ... equipment in another area near the tracks, where I'd stay. After that, both large vertical doors at this factory [abandoned warehouse] were open, allowing for noise because they are cleaning the place. Shortly after the cleaning project was launched, another area denial tactic started, that took the form of a construction staging area. 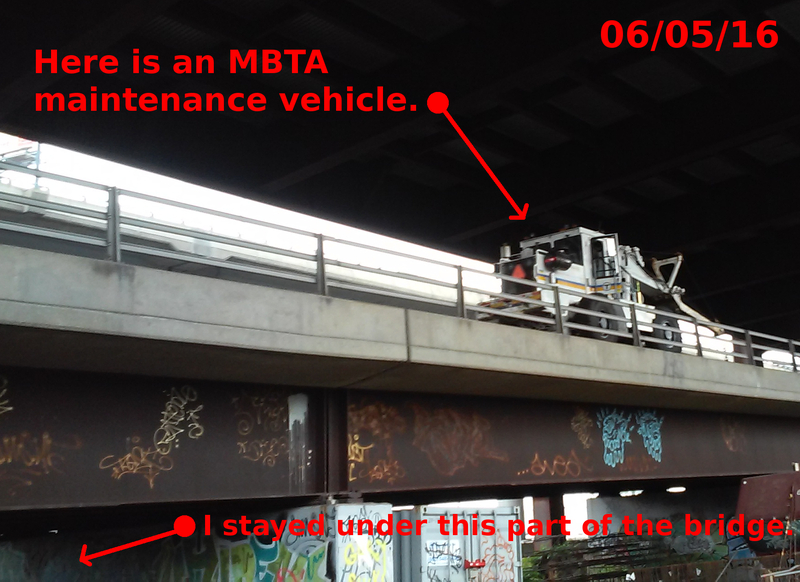 A construction crew was established closer to where I was situated, under the MBTA Orange Line tracks. This crew generated additional noise. Their movements were synchronized with my activity (pacing). "They [construction workers] usually are synchronized with my movement; making noise & abruptly appearing, based on my activity; pacing me." 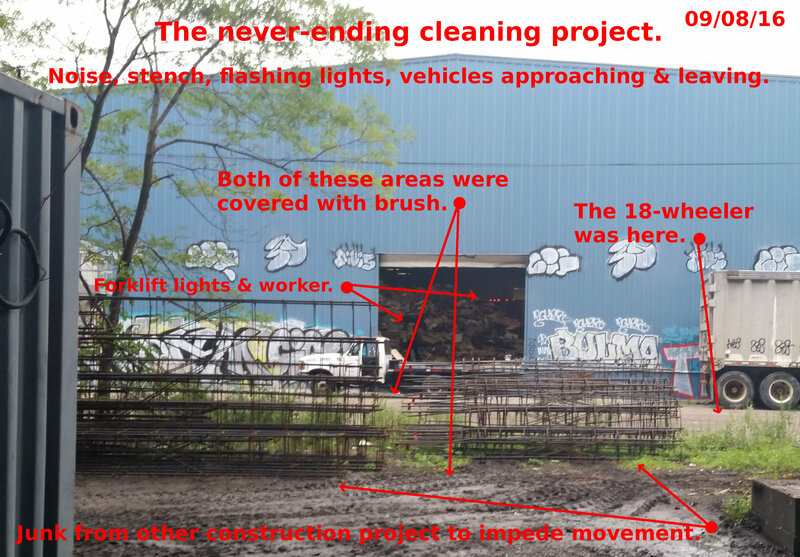 "This means there were two construction projects; [the] cleaning one in the abandoned building & another one outside [near the bridge/tracks]. This day there was additional noise from another construction project at gate of area. Loud, nearly continuous noise. They have also used stink [malodorants] for area denial." 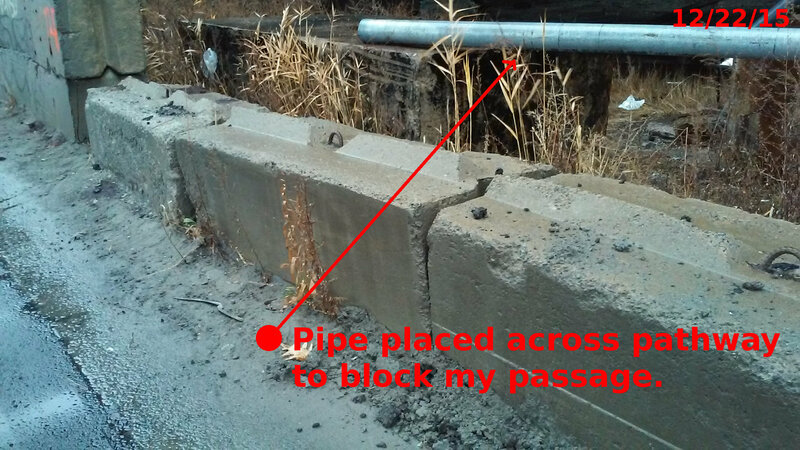 When a construction worker approached me for a conversation on 03/25/16, I ignored him. 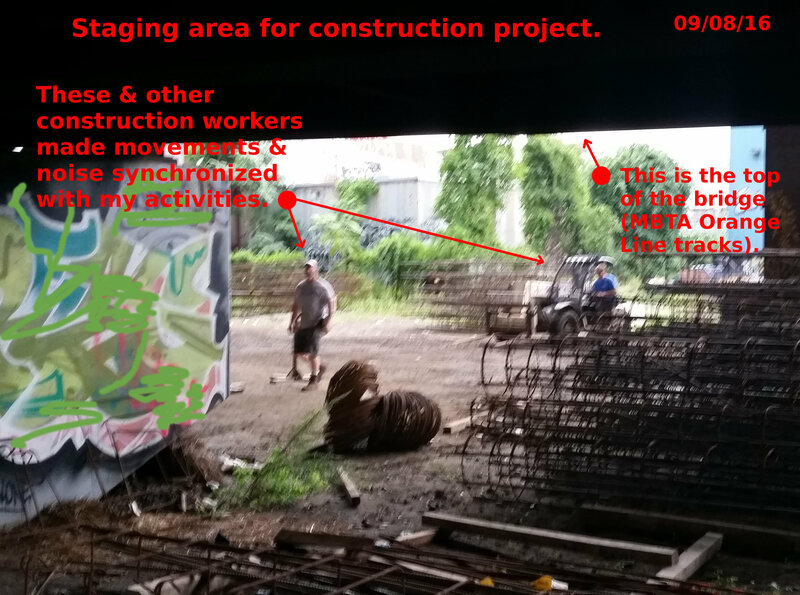 "The area right beyond under the train tracks where I stay has been completely covered with construction material. Still noise from the cleaning crews in the buildings; beeping forklifts." At first, they were not actually under the bridge. Eventually, they moved their equipment under it, to further restrict my access to a significant section of the area, & impede my movement beyond it. I noticed on 09/08/16 that the construction junk was moved even closer, & placed under the bridge. In addition to the barriers placed in the area to impede my movement, the narrow pathway I'd use to access the place was blocked with a variety of trash. Some of these were products to support whatever PsyOp theme was being conveyed at the time. "Construction project directly above me on Sunday. Tracks being worked on. Noise almost the entire day. Also noise from cleaning project at warehouse." Since mid 2014 their covert attacks to deny me use of the area, included: ceaseless noise (screaming, beeping, sirens, engines, hydraulics, slamming objects); barriers; malodorants; flashing lights; & PsyOp. Plus, there was more racket from the other side of the tracks/bridge, that included horns & sirens, as well as the commotion made by patrolling commercial vehicles & 18-wheelers. "Constant noise at industrial area I stay sometimes on road. To left of where I stay [there is] beeping & engine noises from cleaning in previously abandoned building, that has been going on for 2 years. Area closer to where I stay is used as staging area for construction. [There], small construction vehicles [are] making noise. Visual commotion; [their] movements [are] synchronized with [my activity]. On other side of me, there are the vehicles patrolling back & forth, [along with] beeping from trains & frequent sirens." Because surrounding me with constant commotion did not facilitate my removal, they finally used the police to kick me out, on 09/10/16. At about 545PM I arrived at the closed Charlestown Branch of the Boston Public Library to send a tweet. I avoided one person walking down the stairs that was positioned to crowd me. While getting situated, there was beeping & yelling from the corner of Main & Austin Streets. A person walked up the stairs & threw a stack of books on the concrete in back of me. Moments later, a woman stopped on the sidewalk in front of me & attempted a conversation. She babbled something about a "ticket" to "Lincoln." I ignored her. This was a PsyOp phrase pertaining to Lincoln, New Hampshire, where I recently traveled to & from, after purchasing bus tickets. When I attempted to send a tweet, the Twitter program malfunctioned. During this time I was hit with directed-energy to my torso. All of this (CNO, noise, swarming, PsyOp, directed-energy) occurred in a span of about 5 minutes.